What is the purpose of art? Ask a dozen people, and you’ll likely get 12 different answers. Pablo Picasso said, “Art washes away from the soul the dust of everyday life.” Perhaps this was his way of expressing how art inspires and uncovers the truth. Window film is a cost-effective way to produce large-scale art for your business. The purpose of art in the workplace is often utilitarian: it displays the company logo and branding. While this is a worthy mission, art has the power to do more. It can affect change in the people who experience it. Art boosts worker productivity and wellbeing. Those were the conclusions of a 12-year study of work environments by researchers. Dr. Craig Knight of the University of Exeter found that people worked faster and felt better in environments decorated with art and plants compared to those who worked in settings containing only the necessities. In workplaces enriched with art and plants, productivity increased by about 15 percent. Productivity soared by 30 percent when workers had a say in choosing and arranging their decorative items. 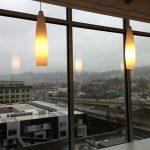 At Pacific Window Tinting we’re big fans of art installations in commercial settings. In addition to our tinted film for windows, we design and create graphic installations. Our talented designers use a custom plotter to create show-stopping images. We also install large graphics and murals which can be custom ordered. Take a look at our graphic gallery to see some of our work. What Kind of Art Boosts Morale? A specific type of art wasn’t prescribed in the study. Knight, the study’s author, did have one caveat: motivational posters, the kind with inspirational sayings, don’t work. The art needs to be visual, emotionally or intellectually stimulating. Traditional media such as painting and photography are mainstays, especially in conservative or corporate cultures. Interactive displays, so-called kinetic or light installations, may be more in tune for tech or creative businesses. Art can reflect a company’s brand and philosophy. We can create film that explicitly expresses your business logo and motto. We can also create images that indirectly reflect your values. 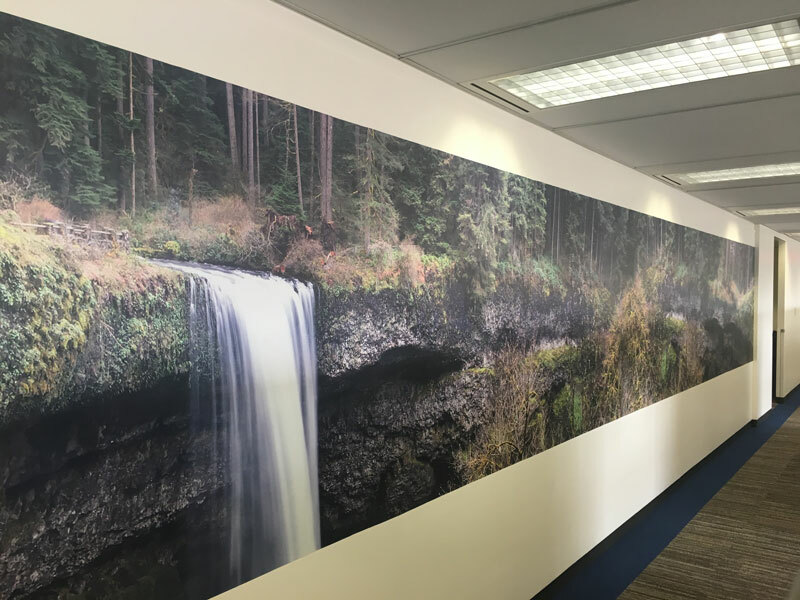 For instance, if your company is committed to protecting the environment, why not create an installation to celebrate the natural wonders of Oregon. Knight found that a stripped down or minimalist decor didn’t improve productivity or focus. Art engages people’s mind and emotions, drawing them into an environment. Some businesses use art and enriched environments to attract and keep employees. Making a space that supports and uplifts people attracts creative workers. Ready to make your workplace more inspiring with custom graphics? Get in touch today for more information about our services. Rebranded? Share Your New Logo with Decorative Window Film!